I can remember when my dad first mentioned the grant that was won by the East Fresno Kiwanis to fund the Hidden Homes project in Fresno over two years ago…and the first time I visited the site with both my parents. I have since been back several times, most recently with my Aunt Lydia (who designed the map in the picture above)…and while I may not be “outdoorsy”, I have always appreciated the landmark that my dad and the East Fresno Kiwanis Club were developing for their community. The project is complete and the dedication is planned for September 8th. 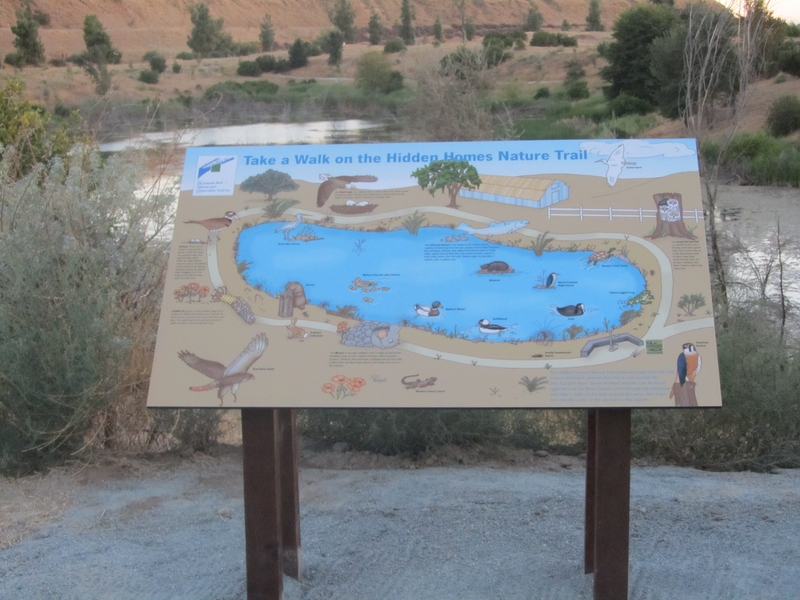 Here’s a link for more details about the river center: Hidden Homes Nature Trail. If you have ever been to my house in Dallas, you would notice that there’s a whole lot of floral art around the place (for a bachelor’s pad). I have most of mom’s watercolors framed around the house and they represent those rare remembrances that never make me feel melancholy or sad (unlike the J. Jill catalog that is always deceptively mixed-in with the other less-emotionally charged mail, or the random Justin Timberlake song on the radio). But besides being really cool flowers and being a project that my mother and I worked on together, the painting has a lot of meaning for me because of a story that my grandmother likes to tell. She’s told me this story several times and always laughs out loud while she tells it. Once when my mom was a little girl, she got really upset with my grandmother over something. Later on that same day, my grandfather took my mom to run some errands with him, and they brought back some hydrangeas or “hortencias” as my grandmother calls them. My grandmother said that she smiled when she saw the flowers and told my mom that they were very beautiful. According to my grandmother, my mom replied in Spanish (she could only speak in Spanish at that time), “you’re only pleased when I bring you hydrangeas”. When I transcribe this story, it doesn’t sound very funny…but you should hear my grandmother laugh when she tells it. Perhaps there is something missing in the translation. 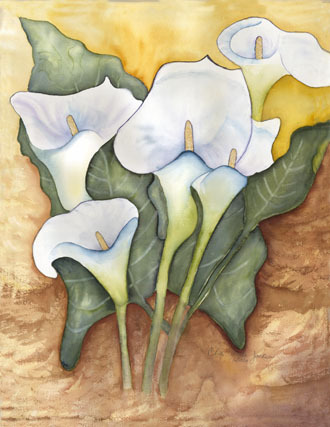 Anyway, my other favorite painting is of calla lilies. Mom painted calla lilies several times, but this one is my favorite out of all of them. I recently wrote about this painting for a paper I had to turn in for my masters program. The professor asked us to choose either a tattoo or a song that could be used to represent our values (it’s one of those touchy-feely psych courses). All of this mushy stuff might be a little TMI, but it’s mom’s birthday, so I thought I would share it. I have spent quite some time thinking about my preferred method of values identification for this assignment. Starting out, neither the tattoo or the song option immediately seemed appropriate. Personally, tattoos have never really resonated with me. I can appreciate the art form, but I have never felt comfortable with permanently marking my body in that way. Music, on the other hand has always been a big part of my life. But when asked to find a song or lyrics that can in some way represent my beliefs and values, nothing seems to fit. So rather than focusing on the contextual medium for this project (a tattoo or a song), I decided to start thinking about my values in general. What are my values? While I tried to answer this question, I looked up at a wall in my dining room and noticed a watercolor that my mom painted several years ago. My mom passed away last summer, but over the past two decades she produced several watercolors that I have placed throughout my house. The particular painting that I reference herein is of calla lilies. Calla lilies are fairly common subjects in art. Diego Rivera captured their gentle elegance often. Robert Mapplethorpe made them look almost sensual in a series of photographs. And my mom used them as subjects in her watercolor paintings frequently. But even though my mother produced several different versions of calla lilies, there is one particular painting that seems to make me recall who my mother was most vividly. This was the painting that caught my eye as I sat down to think about this assignment. And just at that moment, this assignment started to feel much easier, and the best method for articulating my values became much clearer. The image on the wall that my mom had left behind was really representative of who she was for me, and the values that seemed to guide her throughout her life. Values that I also think are a large part of my family, my upbringing, and who I am today. Calla lilies to me are a very modest flower. They are simple in shape without a lot of frilly petals. They always maintain a very subtle color palette but the creamy white variety is my favorite and seems to be most popular. Modesty was also a value that seemed to define my mom. After she passed, it was amazing to hear from so many people who offered their condolences but had never actually met her before. They simply knew of her because as one person expressed “your mother flew beneath the radar”. I believe that this was a big part of my mom’s values; she preferred to work quietly where she was needed and out of the spotlight. Sincerity is always in doubt when someone tries to convince others of their own modesty, so I will not even try. But even as a child I have always admired how both of my parents never seemed influenced by either vanity or envy. I think that their modesty made them very tolerant and understanding of others. Without being proud or boastful, they always seemed happy with who they were, what they had and what they could offer to others. This is a high standard to maintain. I would like to think that someday I will achieve this level of modesty, but this is still an area that I need to work on. I often find myself wanting something that I do not have, and feeling envious of those that have it. I also fear that I can be somewhat judgmental at times. But there is another aspect to my mother’s calla lilies that I think is worth mentioning. The subject of this particular painting is not in perfect alignment. Some of the leaves are bigger than the entire length of the flower and its stem combined. Indeed, some of the flowers seem to be missing their stems, and are just standing without support beneath them. These “imperfections” are a large part of what I like so much about this painting, and why it catches my eye every time I walk past it. Whenever my mom would work on a painting, she would usually show it to one of us throughout its various stages of completion. I would often look at the painting or sketch and immediately focus on an imperfection and say “the perspective is off” or “the proportions are not right” or ”that leaf is too big”. She would always agree and sometimes she would even say “oh, I hadn’t noticed that!” Her reaction would always lead me to believe that I had done her some kind of favor by catching the mistake early in the process. When the painting was finished, I would always look for my input in the final version and arrogantly expect that my suggestion might have saved my mother’s art. And without fail, the imperfection would still be there when the piece was finished, and more often than not, it would have been given even more prominence than before. My mom, like her art, was very unique. She was a complex balance of modesty and confidence that I think is rare in most people (we usually seem to lean towards one extreme or the other). She did not feel the need to conform or follow rules that did not make sense to her or her values; in life or in art. She embraced differences and unique qualities in herself as well as in others. She was loyal to her convictions, even when they were doubted or criticized. I think that I have often emulated these values in my own life. By not settling into the traditional life of family and children, by living overseas, and by returning to school at the age of forty-one, I think that I have done a pretty good job of following this example set by my mother. I also think that while I do a good job of listening to the perspective of others, in the end I have the self confidence to choose my own path. And finally, when I see this painting I also feel a tremendous amount of gratitude. My mom started painting just after she was first diagnosed with cancer. I think that she used her art to help her through some of the pain that she was feeling at the time. I also think that she used her art as a way of leaving something behind for the rest of us, after she was gone. There are many things, songs, recipes and places that constantly remind me of my mom, and I often feel sad when I think of her. But her paintings never make me feel sad. They help me to feel like she is still near. They were a generous gift that I feel very grateful to have in my home. It is my hope that I will leave something behind when I am gone some day as well. Modesty, conviction and generosity are three prominent values that I see in this painting. They are values that seem to be shared by those that I love and are values that I try to emulate in myself. If there was ever an image that might be appropriate as a tattoo that could represent my values, it would be based on this painting by my mother. Birthdays and summer kind of lost some of their coolness for “adult me”. Neither event is really anything that I particularly look forward to as was the case when I was a kid. Back-in-the-day, summer just couldn’t last long enough and birthdays couldn’t come too soon. Mom’s birthday is in a couple of weeks, and she always seemed to look forward to it (though she would have claimed the entire month of August as “her month”, not just one day). I still get the J Jill catalogs in the mail ALL THE TIME, which used to be kinda fun – mom was very easy to shop for, mainly because I think she just liked presents. And pretty stuff. I know that some people choose to celebrate the happier anniversaries of life rather than the dates that someone passed away, etc., and that is what I plan to do this year. This summer has actually been a lot of fun for me. 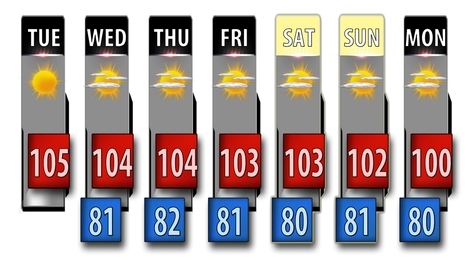 Lots of BBQ grass-fed beef and mojitos by the pool, Crossfit and 3-day weekends. Life is good. I hope that you are having a good summer too…and if not, check out this video. Sometimes I watch it on mute when I am at work. It makes me happy… every time. OK, OK, I don’t do this very often on this blog. And yeah, there’s some “fist bumping”. But I love this kinda stuff.